One convenient kit gets you started in the latest trend in miniature organization. Create your own planner or address book in a matter of minutes. It is made of the same durable material as other C-Line binders, but offers a more compact storage option. Whether you are looking to create your own daily planner or would like a way to sort store coupons, this starter kit is ideal. Features the essential items needed for on-the-go organization. The kit is ideal for the storage of papers, items, and more up to 5-1/2" x 8-1/2" in size. Kit includes one mini poly binder, 1 set of mini poly index dividers with pockets, 50 sheets of mini filler paper and one mini poly binder pocket with hook and loop closure. Accessory items are universally punched to fit in standard 5-1/2" x 8-1/2", 6" x 9" and 8-1/2" x 11" binders. Plastic items are made from durable, heavyweight polypropylene. 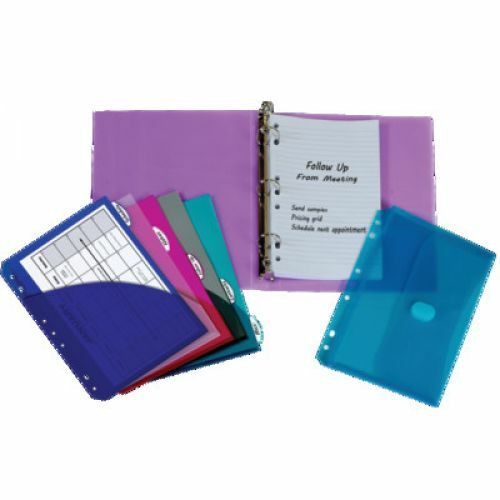 Kit components come in assorted colors: binder is blue or purple; index divider set is blue, clear, pink, smoke and aqua; paper is white with black ruled lines; binder pocket is aqua or smoke.